One of our most valuable design tools is three-dimensional, computer-generated modeling of the home’s exterior. It enables clear visualization of all aspects of the house exterior, including rooflines and proportions, by providing a virtual “walk-around” of the proposed house. We also have the capability to insert the 3-D image of the proposed house into a photo of the existing site to create a realistic image of your new home and garden. 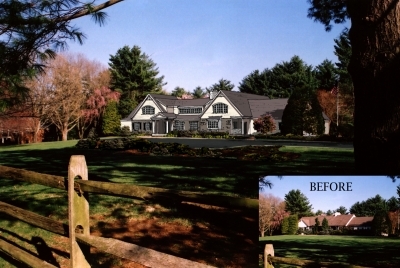 The conceptual design shown at right was modeled in 3-D using SketchUp, then imported into an image of the actual site to provide our clients a realistic representation of the planned remodeling of their home.